Let's move Young Eagles from the right seat to the left seat! Working with EAA’s Young Eagles program, Next Step capitalizes on the excitement created by a Young Eagles flight. For those whose excitement has been fostered by an airplane ride, Next Step makes it easy for these young people to pursue their interest in aviation by providing them with a number of benefits, the most important of which is free and unlimited access to Sporty’s Complete Pilot Training Course online. In addition, each Young Eagle who has taken a ride is provided with their own logbook to record all of their aviation experiences. When your child comes to you and says, "I want to learn to fly," some parents will be thrilled, knowing that their child is carrying on a family tradition, like his mother or father, grandfather or cousin. 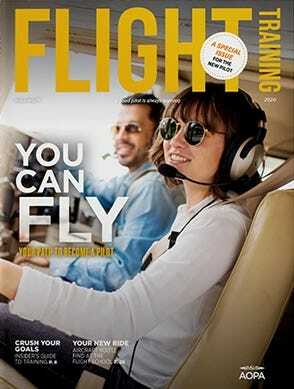 Many new pilots, especially young ones, come to flying because a family member or close friend is a pilot. But for some parents, whose only experience with flying is on an airliner, with no one close to the family, being a pilot may seem like a far-fetched goal. After the initial reaction of "Say what?" you may have difficulty imagining the kid who can't get up on time for school actually at the controls of an airplane. We understand your concerns. We're parents too. So whether what you're feeling is confusion, disbelief or even fear, we want to assure you that becoming a pilot is one of the wisest choices a teenager could make. Why? Being a pilot teaches discipline. Being a pilot requires study. Being a pilot enhances a teen's knowledge of math and science. Being a pilot gives your teen a credential that will make them stand out from the crowd - his or her whole life through - whether in a college application or a job application. Being a pilot opens a world to your teen of places he or she may never see otherwise. Being a pilot brings your teen in contact with other like-minded individuals - experienced pilots and teenagers alike who are living purposeful, successful lives. Last but not least, being a pilot is fun. Sporty's has developed a course of online study to help your teen prepare for learning to fly. Normally, access to this course costs $99, but Sporty's believes in helping grow the ranks of pilots so the course is offered to Young Eagles participants at no charge. There are no strings, no hidden fees, no registration fees, no course materials to buy. To access this preparatory course, all your child needs to have done is to take a Young Eagles flight (also free). We've decided to divide the course into two parts, so your teen will have been given a username and password to sign up. Upon completion of the first half, we'll give access to the second half. Then your teen takes an online test (this is not the written test, but a pre-test). If the student passes the test, we'll issue what's called an endorsement - sort of like an official permission slip to take the real test. You can take the written test all over - hundreds of sites throughout the country. Your best bet is to search an online directory such as the one found at www.LearnToFlyHere.com and find one near you. Have your teenager ask the flight school if they are an official testing site. You should have no trouble finding a place to take the test. So, as your teen is studying, what can you do? Be supportive. Take this activity seriously and even though you may not share your teen's enthusiasm, realize that this is a positive element of your teen's life. Locate a mentor. You probably know people who are pilots, or know people who know pilots. Every new pilot needs some encouragement and help. Visit www.learntoflyhere.com. Here you will find numerous resources Sporty's has compiled for individuals interested in or learning to fly. This site contains everything you need to know, from finding a flight school to what it takes to earn a pilot certificate. Help your teen find a flight school. There's no one best flight school, just as there is no one best college. Get involved in the selection process and ask lots of questions. If you are paying for all or some of the cost of flight training, remember that learning to fly is a pay-as-you-go proposition. You don't have to pay for all of it upfront. Bear in mind, too, that pilots take pride in having paid their own way. Being a pilot is a lifelong accomplishment. Unlike a driver's license, a pilot's license never expires. Think of the pride you'll feel if you can look up at an airplane overhead and say, "My daughter (or my son) is flying that airplane."